It’s quite an accomplishment to build the instrument Leonardo da Vinci envisaged but never realized. Now Sławomir Zubrzycki is taking it a step further. The Polish pianist and the builder of Leonardo’s viola organista plans to record an album of music performed on the instrument. Zubrzycki has launched a Kickstarter campaign to fund the album, and with a bit less than a day to go, he’s getting close to his goal (Update, Thursday, Aug. 20, 5:30 a.m. CDT: Zubrycki has met his Kickstarter goal). The Kickstarter page features additional video of the viola organista in performance (the one we posted proved quite popular with our audience). And like any Kickstarter campaign, Zubrzycki offers incentives for potential backers, including a generous offer for the most generous donors: A house concert performed by Zubrzycki on Leonardo’s instruement. Zubrzycki has qualified, however, the recipient(s) of the house concert must live in Europe. He’s not planning to transport the viola organista overseas … at least, not yet. We’re not sure if a concert, an album and a tour were among Leonardo da Vinci’s original visions for the viola organista, but it’s unlikely the feverishly inventive polymath would have disapproved. You can view the original post of Zubrzycki performing on the viola organista here, and his Kickstarter progress can be tracked on that site. We have music on the stereo at home all the time, usually from CDs that I am auditioning (of which there are piles and piles). Yesterday, though, Lise was outside weeding, I was inside beginning to go through stuff brought back from my brother’s house. But we breakfasted together, in the glowing morning sunlight, to Messiaen’s “Turangalila” Symphony  the new Finnish Radio Symphony recording on Ondine, with Angela Hewitt playing the important piano part  what music is more filled with joy and amazement?! A perfect accompaniment to nature’s cheery brilliance. Got through a lot of music on a beautiful Sunday. Paul McCartney is playing a concert in Minneapolis on Saturday, Aug. 2. 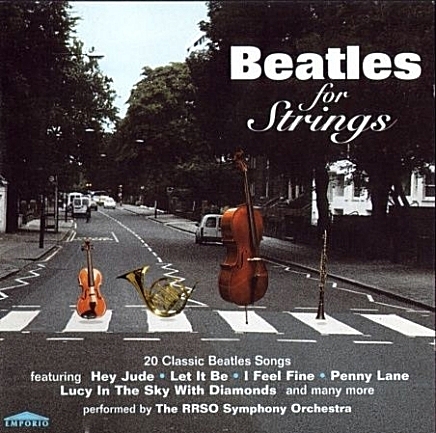 Given the ubiquity and universal appeal of the Beatles’ music, it’s not surprising there are a number of orchestral settings of Beatles’ tunes. According to the liner notes, Les Boréades were recording an album of 17th-century Italian music when they all started riffing on Baroque settings of Beatles music. 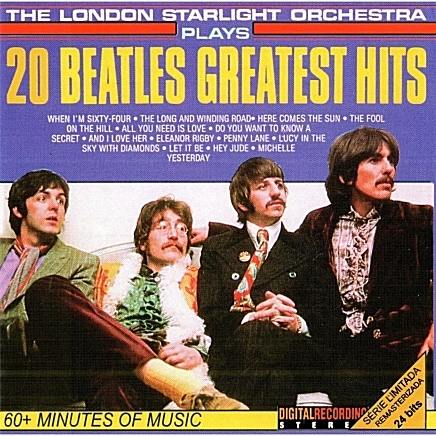 Producer Johanne Goyette had to promise Les Boréades they could record this album of Beatles tunes only if they focused on getting the Italian album finished first. 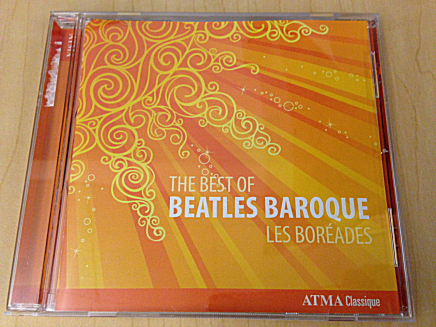 Les Boréades got that done, then went on to record three albums of Beatles Baroque, of which this CD is a “best of” compilation. 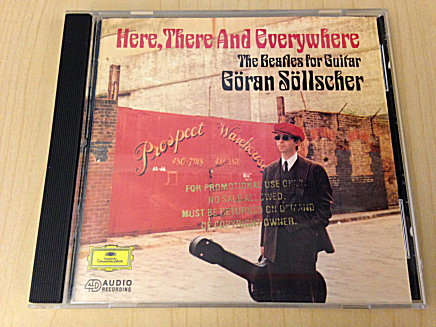 Guitar virtuoso Göran Söllsher’s collection features 17 Beatles tunes arranged for classical guitar. The liner notes feature an introduction written by George Martin. “These are beautifully played transcriptions of many of the Beatles’ most beloved tunes,” says Jennifer Anderson, Classical MPR’s assistant music director. 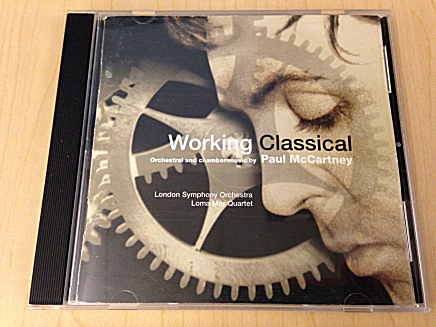 “This is one of McCartney’s most interesting classical discs, with inventive original compositions and lovely orchestral re-workings of some of his most popular songs,” Anderson says. 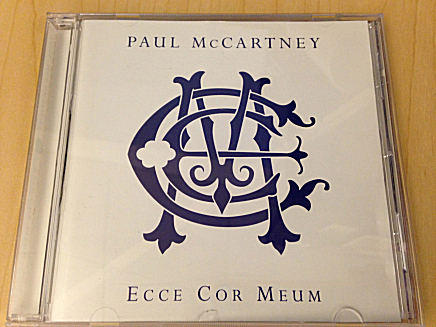 Recorded at Abbey Road Studios in London, this is Paul McCartney’s own collection of classical-music compositions. The title means, “Behold My Heart” and the musicians include the Academy of St Martin in the Fields, soprano Kate Royal, the Boys of Magdalen College Choir, Oxford and the Boys of King’s College Choir, Cambridge. 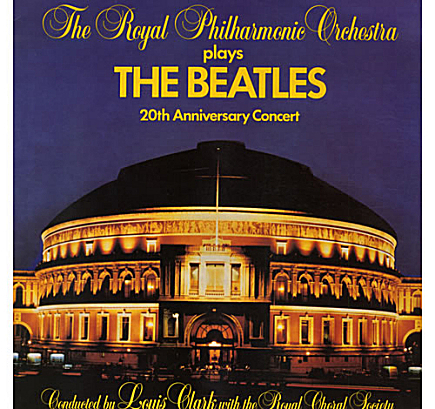 Do you have any orchestral recordings of Beatles music in your collection? Why are classical album covers so boring? The final volume of BIS’s Bach cantata series–volume 55–is one of the most notable recent classical releases; among other plaudits, it was highlighted by BBC Music Magazine as the single most outstanding release of the month. Understandably, conductor Masaaki Suzuki appears on the disc’s cover looking well-pleased. Of course, he also looked well-pleased on the cover of volume 54. Now, I appreciate that BIS had more urgent concerns to attend to than designing 55 entirely distinct CD sleeves. That said, it seems odd that with such a distinguished recording series, there was so little effort to generate visual excitement. Classical labels may run on shoestring budgets–in fact, they certainly do–but the classical world seems to be slow to pick up on the reality that’s already been acknowledged in other media realms: the content may be king, but a king has a hard time ruling when he’s dressed in rags. Limited budgets notwithstanding, classical labels seem perversely driven to draw attention to their packaging design struggles. I wouldn’t even have noticed the Suzuki repetition, for example, if BIS hadn’t positioned volumes 54 and 55 right next to one another in a large print advertisement. Then there’s this trick, where the same photo shoot is made to do double duty with slightly varied poses. Even the stock images of flowers, cathedrals, and composers are better, since at least they can be varied. They might be boring, but boring is probably preferable to laughable. Then there are those designers who draw plenty of attention to their album covers–but for the wrong reasons. 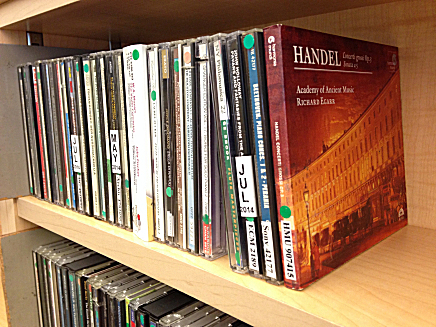 Can classical music’s design problem be solved–within a budget? Possibly. Consider what’s happened with classic literature: enterprising publishers are enlisting comic book illustrators and getting creative with type to put fresh faces on books by dead authors. Word Cloud Classics, a series from Thunder Bay Press, uses textured plastic covers to add a new tactile element to the act of reading. What do you think? What are your favorite classical album covers? What covers do you never want to lay eyes on again? Is there anything the classical world can reasonably do–within its limited resources–to step up its design game?